Hello again everybody! I hadn’t planned on turning my thoughts on Alabama into 2 parts, but last post, my mind was in 10 places at once. I couldn’t concentrate so now I will finish. 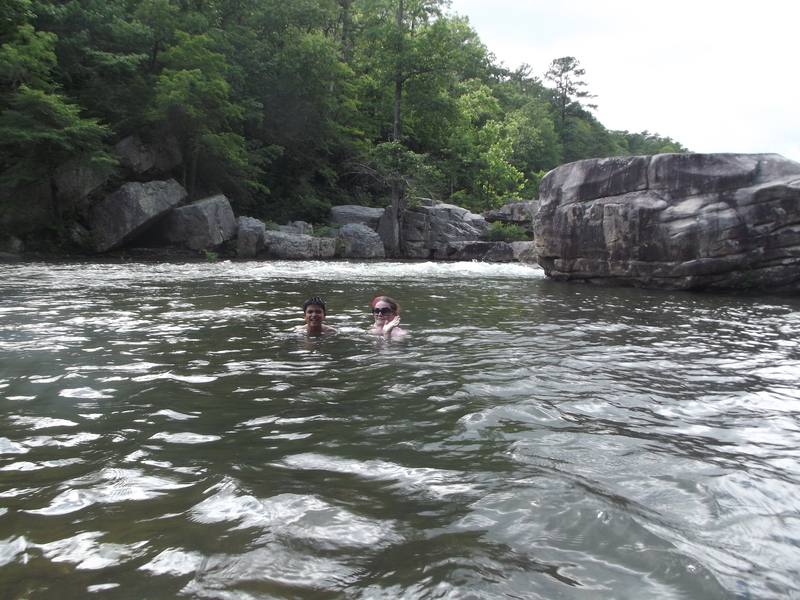 The first dip in the river was excruciatingly freezing!! I was not prepared for that at all, but hey, on a summer day, why complain?? It was rather refreshing. 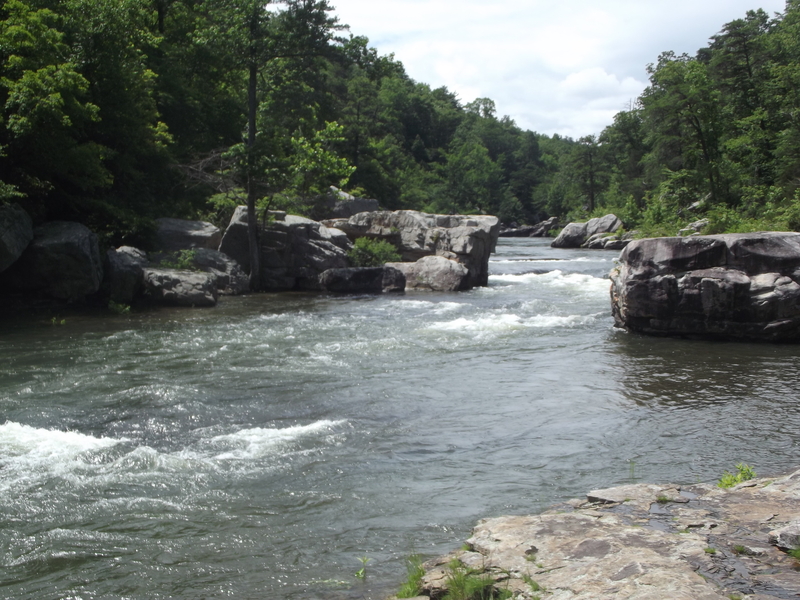 However, the bottom of the river was all uneven rock and my family had a hoot laughing as we were constantly slipping. I did hurt myself pretty badly at one point, but what a blast it was that day. That was pretty much it for that day. We spent hours in the river and were exhausted by the end. The next day of course we hit the road again, and ended up at Sequoyah Caverns. The drive to the caverns was very rural and more than once we were uncertain if we going the right way ( and more than once an Alabaman helped us on our way). 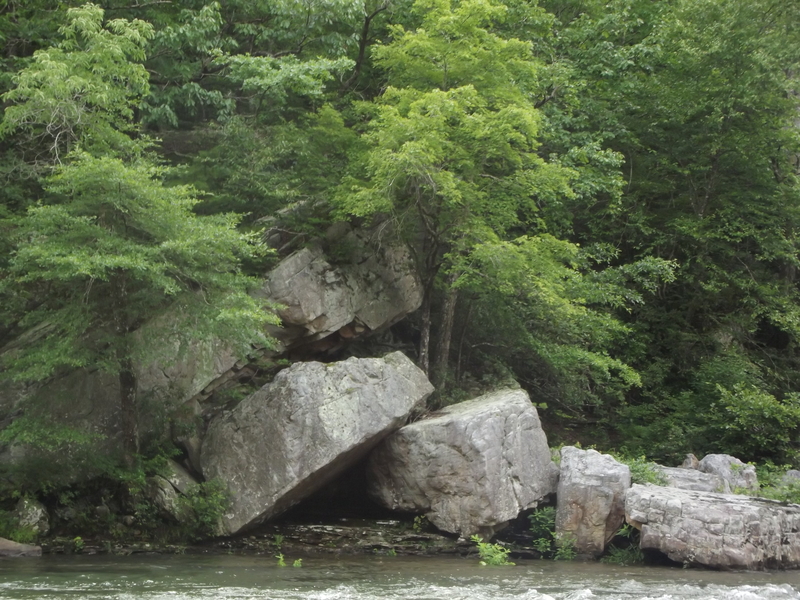 It was in the mountains, and sorry but I never imagined Alabama as mountainous, even though the Appalachian Mountains run through the state. It’s funny how we see things a certain way in our minds even after we know they’re not necessarily true. 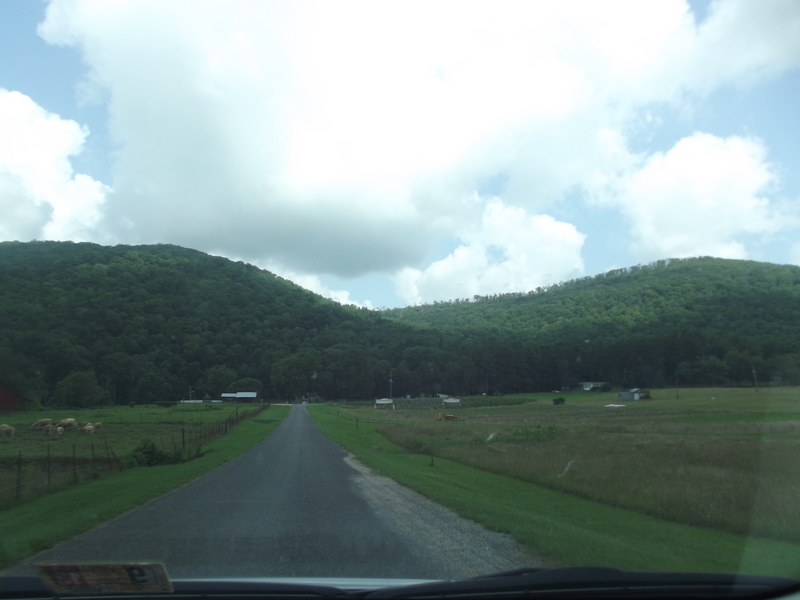 I loved the country road we drove down toward the caverns. 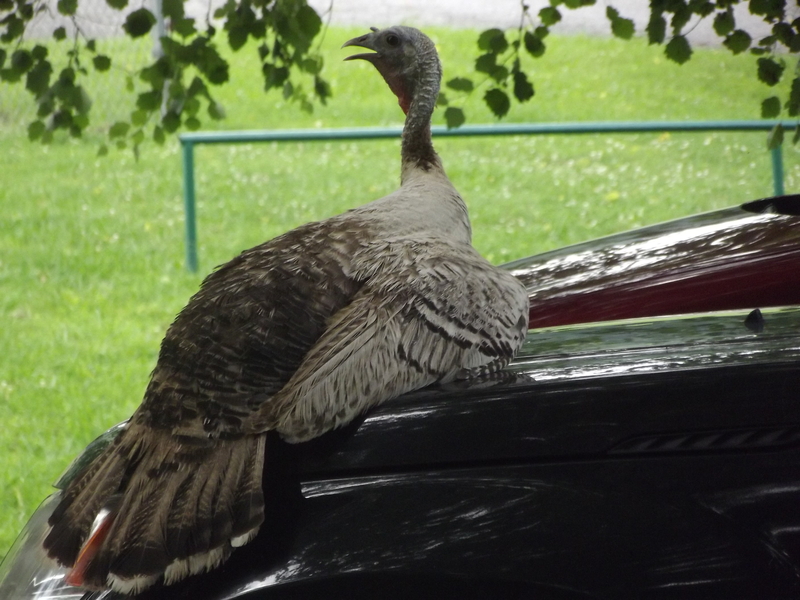 Cattle and turkeys roamed the area. The land is preserved as it must have been in another century. 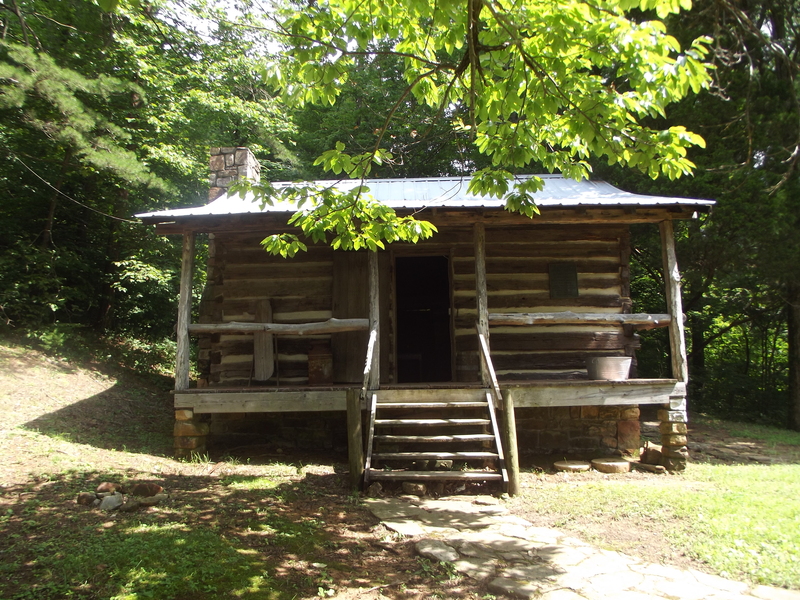 A little log cabin sits on the land which you can admire before entering the cool caverns, and I mean that in the most literal sense. As soon as you enter them, you become cold. Again, great relief from Alabama in summertime. I’ve been inside caverns before, but I never pass up a chance to see another one. We saw the usual stalagmite and stalactites, but this tour guide pointed her flashlight on things others have not on tours I’ve been on. We saw cave spiders (tons of those lil guys in there, ugh!!!) and fossils. Not dino bones or anything, just those little fishy fossils you see in pictures. 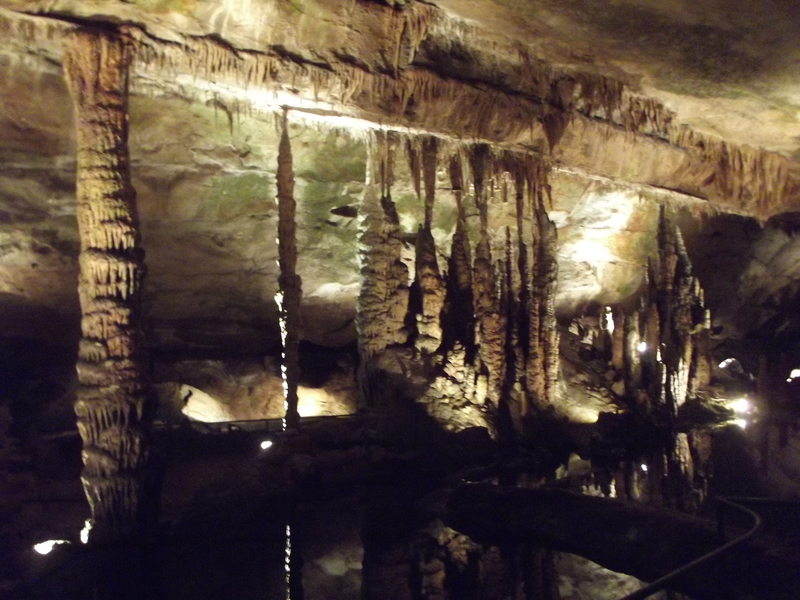 I really liked that she showed us those parts of the caverns that were not strictly part of the formations. I felt like there was so much more inside those dark places than most people will ever know about. Alabama is the name of a Native American tribe. I only learned that in the last few years, as I learned that Mississippi and Miami are also Native American words. And it is a GREAT state! My family visited for the first (and probably only) time last summer. We were also visiting Tennessee so we had a pretty limited time for AL. In fact, we were only there for maybe two or three days, and we were only in the northern part of the state. Being from Northern VA, it was a nice change of pace (and attitude!). We found that the people of AL were always very polite and ready to help. At least three times we had to stop and ask directions to some place or another even though we had a GPS, but there were so many road closures that we were constantly getting lost. I’ve never met such happy, easy-going and helpful people; it was quite a welcome change from the fast pace of where we live. Our first stop was in Gadsden, AL. We arrived in the early evening and stayed in a nice motel overlooking the Coosa River. Across the river were large and lovely homes that reminded me of Florida for some reason. 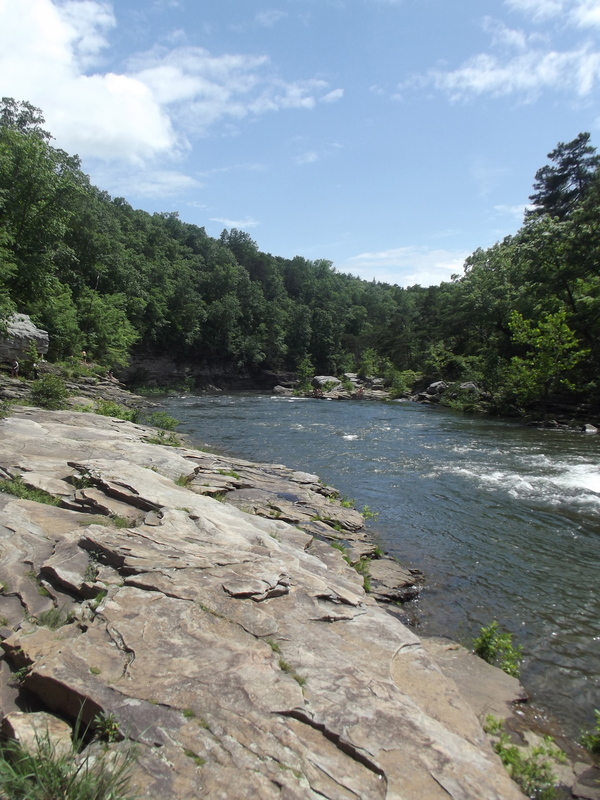 The next day we went to Noccalula Falls Park. It was so hot and humid and UNCOMFORTABLE, but the zoo (part of the park) offered open air train rides which helped cool us off. 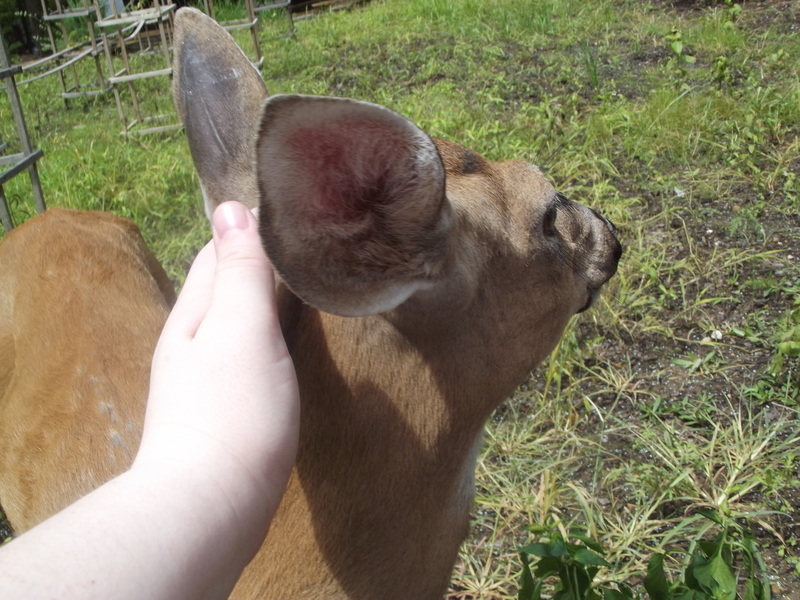 It was a fun little place with many of the animals roaming around freely, much like this deer I’m petting (below). They also have a pioneer village and a covered bridge. I’m a history major so even if my family didn’t care so much about the buildings, to me they were little treasures. After the zoo we went to the waterfalls. The actual falls were gated off, but we were close enough to at least feel the spray of the water (another relief from the awful humidity). 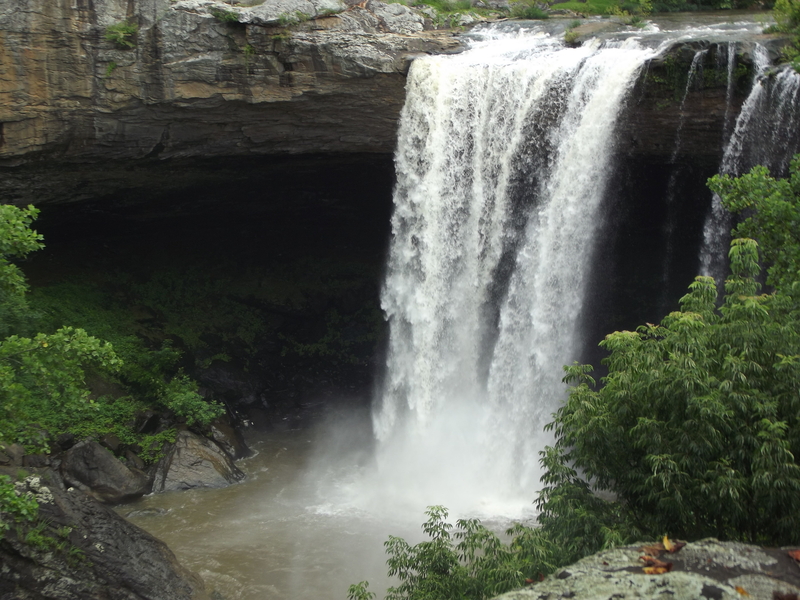 Above the falls stands a bronze statue of an Cherokee maiden named Noccalula. 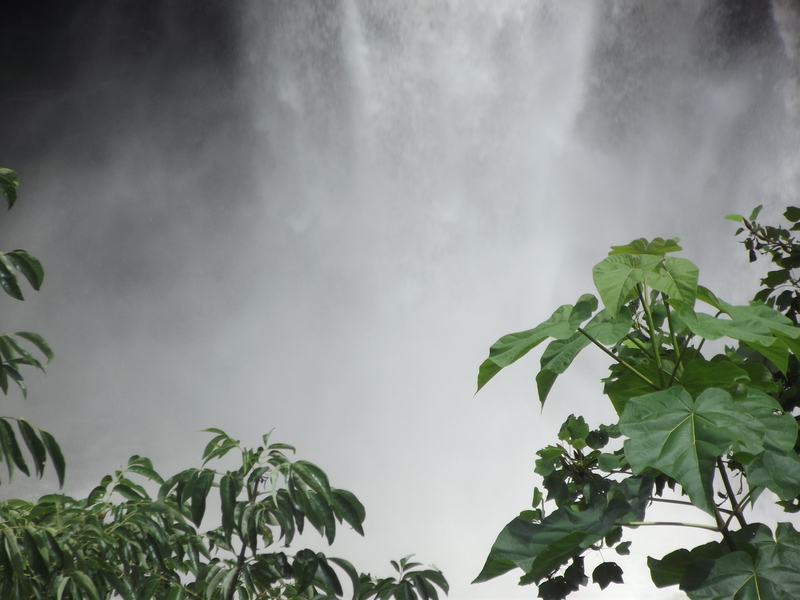 Legend has it that she jumped to her death at that spot above the falls rather than marry a man she did not love as ordered by her father. 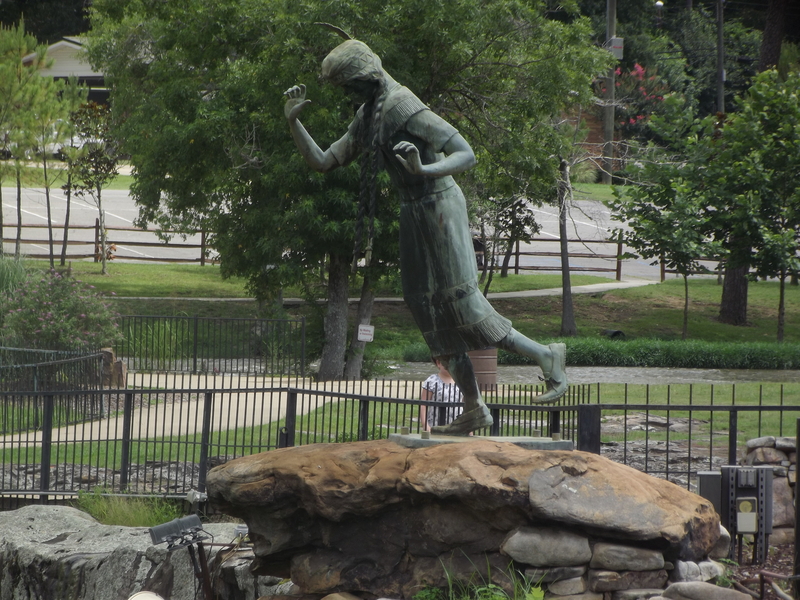 According to wikipedia, the statue was made out of pennies collected by school children in the 1960s! It’s pretty big too. 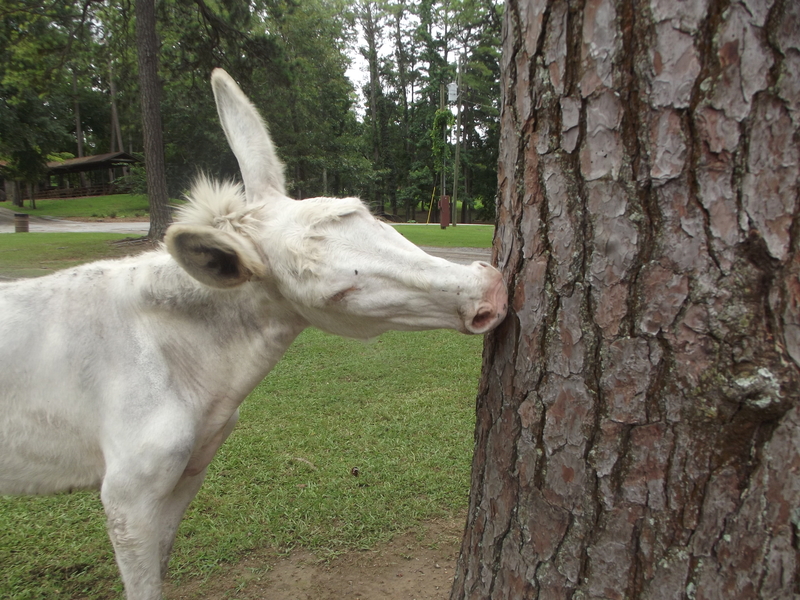 I know this is rather abrupt, but I will finish this Alabama blog at a later time. Gotta run!